A prized focal length for portraiture, the FE 85mm f/1.4 GM from Sony is a fast, short-telephoto lens designed for E-mount mirrorless digital cameras. 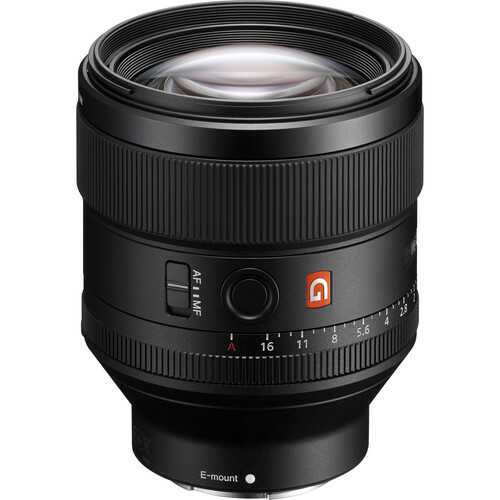 Characterized by its flattering perspective and fast f/1.4 maximum aperture, this lens is adept at isolation focus for shallow depth of field effects, as well as performing in low-light conditions. The optical design incorporates three extra-low dispersion elements to reduce chromatic aberrations and one XA (extreme aspherical) element, which significantly controls spherical aberrations for a high degree of image sharpness and clarity. Additionally, a Nano AR coating has been applied to limit ghosting and lens flare for increased contrast and color fidelity when working in strong lighting conditions. Pairing a bright f/1.4 aperture with a short-telephoto focal length, this 85mm lens is ideally suited for portraiture and other situations where focus control is paramount. Complementing the optical assets, this lens is also notable for its inclusion of an 11-blade circular diaphragm to produce smooth, soft-edged bokeh with selective focus imagery. For controlling focus, a linear SSM (Super Sonic wave Motor) is employed that is quick and quiet, and also lends more responsive control for manual focus operation. The lens also sports a dust- and moisture-sealed design to support shooting in inclement conditions and a dedicated focus hold button, AF/MF switch, and manual aperture ring lend further control while shooting. A portrait-length prime designed for full-frame E-mount mirrorless cameras, this 85mm f/1.4 is also compatible with APS-C models where it will provide a 127.5mm equivalent focal length. Fast f/1.4 maximum aperture benefits working in difficult lighting conditions and also offers a wealth of control over focus position when using shallow depth of field techniques. One XA element is incorporated into the optical design, which features superior surface precision for effective control over astigmatism, field curvature, coma, and other spherical aberrations. A linear Super Sonic wave Motor autofocus system and internal focus mechanism provides quick, quiet, and precise autofocus performance and also contributes to more natural, intuitive manual focus control. An AF/MF switch is located on the lens barrel for tactile control over this setting. Box Dimensions (LxWxH) 8.3 x 5.6 x 5.2"
FE 85mm f/1.4 GM Lens is rated 4.5 out of 5 by 128. Rated 4 out of 5 by Blestage from Beautiful, but... The images this lens is capable of producing are stunning. 3D pop, great bokeh, outstanding colorimetry... I could go on, but it's also a beast. Not just in its pure heft, but in the great growling sound it produces when autofucusing. Be warned. For some, this could be a deal breaker; For me, just an annoyance. There are threads about this floating around the internet. Some copies are quieter than others. Some profess that the latest firmware corrects it. I, however, am unconvinced. It's a noisy beast. Period. But, the gain is a fast, tack sharp, beautiful lens. You decide what's important to you. Rated 4 out of 5 by Jeff from Sony FE 85MM f1.4 GM Lens I love this lens as I shoot video with it on the Sony A7SII, A7RII and the A6300. I love the de-click appeture and that I can pull a rack focus very smoothly with this lens. The reason I gave it a 4 star is that it is a very heavy lens and it does make a chugging noise if you use the auto focus features of this lens. If I was filming with auto focus and want to get a quick focus or use continuous face auto focus my video mic will always pick up the sound the lens makes while it's hunting in continuous focus. Shooting in full manual is great but sometimes I want to shoot wide open and have the camera and lens face track in auto focus while my talent is moving. Rated 5 out of 5 by LeventMagic from The new heavyweight Bokeh King Just got my Sony 85mm f/1.4 G Master today. As expected, it is really big and heavy. The total weight including the lens hood and both caps is 905 grams. It comes with a really nice case that has a belt loop and removable shoulder strap. The autofocus makes a little bit of noise. Not loud enough to bother me personally, but be aware it is not a silent lens when using auto-focus. The fly-by-wire manual focus ring works surprisingly well in my opinion. I was in my backyard taking test shots of my dogs with my A7R and I've got to say the bokeh is really superb. If you are willing to carry the weight and are ok with autofocus noise, this is a great portrait lens for the Sony E mount. Rated 5 out of 5 by @Duelinglenses from Nice to have a sharp native lens for my A7Rii. I've had the Sony A7Rii for close to a year now and have been using my Canon glass with a Metabones adapter. This combo has worked great for landscapes. But for portraits situations it was more of a hassle getting quick focus and I seemed to lean a lot more on my 5D MK3 to get the shot. Plus I couldn't use some features on the camera like eye detect. Which is really nice with this new G series lens. Now I have a lot more confidence shooting my A&Rii in portrait situations where I can allow the model to move more. The images are super sharp. Less CA than my Canon 85L. The attached pic is a 100% crop. With a little sharpening in Capture One. I find the noise of the AF a non issue at all. Rated 5 out of 5 by Anonymous from Stunning portrait lens for A7s11 I had the opportunity to use this lens for three days, before it was stolen. I remember when I realized it was missing that at least I had captured some images on it, beforehand and they are gorgeous. This lens works beautifully with the Sony a7s11, for both video and for stills. I've been shooting portraits and working on a web-episodic narrative that involves a lot of facial expression and detail, and the FE 85mm GM is the perfect portraiture lens for my style of work. Thank you B& H for letting me try out the lens before buying, being so helpful with providing a lot of information, and shipping me the lens--right away. Rated 5 out of 5 by Michael from Difficult to dislike After using this lens almost daily since the end of December, I feel comfortable rating it a 5 out of 5. Yes, this lens does have its short comings in my opinion. Most are well documented such as: relatively loud AF motor, focus hunting when shooting stopped down, etc. My biggest gripe is that it has a few too many elements, at least in my opinion. I feel like 11 is a lot for a prime and I would rather deal with cleaning up CA and purple fringe in post if it meant having better saturation and more pop in my images. Regardless, 11 rounded aperture blades + Eye AFC keep this welded onto my A7rii. Rated 5 out of 5 by Derek B. from Expensive but worth it I've been using a Rokinon 85mm lens for year and loved it. Actually I still love it, but this new Sony FE 85mm f/1.4 GM is in an entirely different league. Colour, contract and bokeh are stunning. It's right at home on my A7SII for stills and surprisingly works perfectly in MF mode on my FS7 and FS5. The sharpness you can get at 1.4 is pretty remarkable and the bokeh has this creamy, rich quality to it that makes you smile everytime you see it. It's a somewhat heavy lens and is almost hilarious when mounted to an A7S but who cares if your images are stunning, right? I have the 16-35 f/4, 55 f/1.8, and now 85 f/1.4 from Sony. They are really hitting it out of the park in the glass department these days. 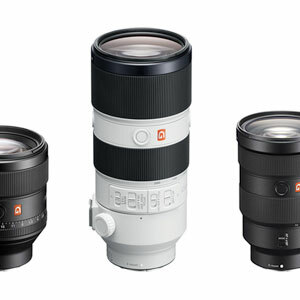 Cannot wait to try the new 70-200 f/2.8 GM as well. Rated 5 out of 5 by Alex from Holy bokeh I am in love with this lens. Build quality is outstanding. The lens feels substantial without being too heavy on my a7rii. The image quality is outstanding and incredibly sharp wide open. The bokeh is simply gorgeous. My favorite feature is the focus hold button on the side of the lens. You can assign it to whichever function you want and on the a7rii it is the perfect place to assign Eye autofocus giving me tack-sharp portraits every time so far. It's obviously expensive, but I want to capture the best images I can and it simply doesn't get any better than this. I can devote all my focus to lighting and composition without worrying that some of my shots won't be perfectly in focus when I take a closer look later on. I feel it is more than a worthwhile investment. Will it fit on the Sony a6300 ? Yes, all full frame jFE mount lenses would fit a regular E mount. Can someone recommend a good protective filter for this lens? Is it compatible with canon 5d3?? Sony's flange focal distance is shorter than DSLR cameras. Due to this, you cannot use an adapter to use it with any other cameras. However, you can use lenses from other cameras with your Sony E-mount cameras by using an adapter. People are writing about friction and noise problems with the lens. Has Sony reported any thing or has B&amp;H inquired to Sony. There is no friction problem with this lens. It's just the sound of the motor. It's not just with this lens but pretty much all lens with big glasses inside usually have louder than usual motors. Some people reported metallic scratching inside the barrel. As it turn out they're not scratches. They're actually the smudges of the grease inside and not really a problem. Does this lens still have the same focusing noise issues as when it was first released or have those issues somehow been addressed? Hi Charlie, after the lens firmware update the lens focusing noise will be less noticeable. Does this lens works good for APS-C Sony E mount cameras obviously considering the crop factor? Yes; the Sony FE 85mm f/1.4 GM Lens with UV Filter Kit, B&amp;H # SO8514GM77F, would be fully compatible for use on a Sony mirrorless camera using the smaller APS-C sensor. Compared to the same lens used on a full-frame camera, when used on the Sony camera with the APS-C sensor, the Sony FE 85mm f/1.4 GM Lens would simply have the equivalent angle of view of a 127.5mm lens used on a full-frame camera. Does the mount on a NEX-5T? Yes, it will mount to any E-mount and any full frame FE mount. This vs Zeiss Otis? Why? I have both the Sony FE 1.4/85 mm GM and the Zeiss Otus 1.4/85 mm ZF.2. I enjoy both lenses. I bought the Zeiss Otus long before Sony offered the FE 1.4/85 mm. I wanted a top 85 mm lens for my Sony a7R and Sony a7Rii. 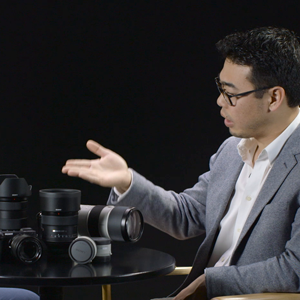 Data on the Zeiss Otus 1.4/85 mm ranked the Zeiss Otus 85 mm the best. Ordinarily I can compose a shot using manual focus so lack of AF is not an issue for me. Sony's focus magnification, focus peaking, and in-body stabilization make manual focus a snap. In fact, I shoot NBA games from my seat with a manual focus Zeiss APO Sonnar 2.0/135 mm ZF.2 and produce great images. I pack my Sony FE 1.4/85 mm rather than the Zeiss Otus 1.4/85 mm if I have to travel light (with only one lens) and when I plan to ask other people to shoot me using my camera. I appreciate that experience and practice are required to manually focus the Sony a7Rii with its focus magnification and focus peaking and I don't expect anyone to pick up that skill when they borrow my camera and take photos of me. I travel to compete in powerlifting championships and I've moved away from hiring a local photographer to recruiting someone from Team U.S.A. to step up and spend time shooting me while I compete. I acknowledge that Sony's AF on its 1.4/85 mm GM is nice. I especially like the focus-lock button on the GM since it allows me to grab focus and recompose without losing focus. This works great in sports applications. Incidentally, the results from my Sony a7Rii and Otus lenses or the Sony FE GM lens have spoiled me so much that I'm dissatisfied with someone offers to use lesser equipment to photograph me. I like a nice JPG, especially from a championship. If you can afford it, buy both lenses. From my perspective, if its worth capturing an image, then use a great camera and lens for the work.